If I had a nickle for every time I saw a horse become an expression of catharsis for a troubled soul on the big screen, I would probably have a lot of nickles. I’m thinking of recent films like “The Rider” and “Lean on Pete.” Where the stubborn male psyche slowly opens up like a flower in Spring-time. Still, flowers rarely bloom in the desert just as directors usually don’t stick the landing on their first rodeo. Don’t tell that to first time director Laura De Clermont-Tonnerre, whose fine debut feature sees a hardened heart blossom amidst the weeds. Her hero is a tumbleweed of sorts. A burly inmate at the Nevada State Prison who spends his time drifting through the dusty corridors and sandy landscapes without saying a word. Why? We are told he is not good with people, a phrase that hardly hints at the anger and anguish hiding behind his reserved exterior. He’s hardly the subject you would expect to come from a French actress turned director. (Imagine Jeanne Moreau going from starring in “Jules and Jim” to directing “The Black Stallion” meets “Escape from Alcatraz”). Still, her meditative pace and lyrical images lasso you in for an unforgettable ride. (Credit cinematographer Ruben Impens for capturing the equine eloquence in the desert landscapes). Things open up with a stunning wide-screen shot of horses galloping across the Mojave desert. Uncaged and uncontrolled. It’s the feeling our hero Roman so desperately yearns for. 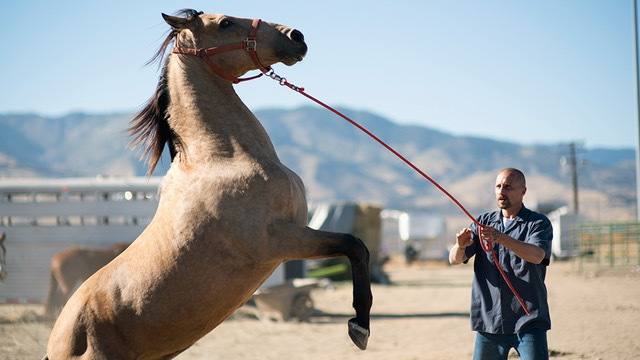 A title card appears, telling us that 100,000 mustangs still roam free, most are euthanized, while a few hundred get trained by the Wild Horse Inmate Program, where they are then sent to auction. And of course, this is how Roman links up with his new pal Marcus–a seemingly untamable horse. Ever wonder what it looks like when an unstoppable force meets an immovable object? This is the place to go. If this premise sounds cheesy to you, it is. The script walks the line between the predictability of Disney and the poetic simplicity of a Johny Cash song. But that doesn’t really matter, especially when your’e gobsmacked by the masterfully understated performance by Matthias Schoenaerts. There’s beauty in his simplicity. His defeated posture exudes vulnerability and his frantic eyes tell a different story than his tatted, herculean physique. Though Clermont-Tonnerre doesn’t take the easy way out. She presents him as flawed–he punches a horse!– and occasionally, dare I say, as a brute. This is why he needs his horse and his horse needs him. They are both wild spirits in need of connection. He tries, oh how he tries, to find that connection through his daughter Martha (Gideon Adlon), with heart wrenching results. Later, his clouded eyes lighten as he befriends a fellow inmate named Henry (a chirpy Jason Mitchell), and the program’s director played by Bruce Dern, an old timer with rabbit features. But it’s the horse who is always there for him. When Marcus rests his head against Roman’s, you will wish you had brought extra tissues. Which is an issue many will have throughout this Robert Redford-produced drama. Since Tonnerre trojan-horses raw emotion into her film through elongated pacing and by using a fly-on-the-wall technique. Her film feels discovered rather than shot with a camera crew under the scorching Nevada sun. Much like “The Rider”, another female directed drama about mans connection to his horse. This isn’t nearly as moving, and it runs a little long, but the results are still astounding and never dull. “The Mustang” has horsepower to spare.